I'm pretty sure that even if I didn't work 3 blocks from Union Square, I would find an excuse to make it to the Union Square Greenmarket at least twice a week. And hey if there are local restaurant chefs stocking up on fresh produce in the morning and Top Chef contestants strolling through in the afternoon, it must be good. Everything in this recipe (except for the olive oil) is from the market, right down to the eggs! Poach Eggs: Bring a small pot of water + 1 tbsp vinegar (helps egg whites stay together) to a boil. When the water is at a rolling boil, turn it down to a simmer. Crack 1 egg into a small, shallow bowl, and carefully slide it into the water. Use a spoon to wrap the whites around the yolks. Do the same with the second egg. After about 3 minutes, use a slotted spoon to transfer eggs to a paper towel to drain. This will give you set whites and a runny yolk. For a firmer yolk, increase cooking time. Prep Salad: Spread the arugula on a plate, followed by the tomato slices, garlic, olive oil, salt and pepper, and chiffonaded basil. To chiffonade basil, pile the leaves on top of each other, tightly roll them, and thinly slice across the roll. You should end up with something resembling basil confetti. 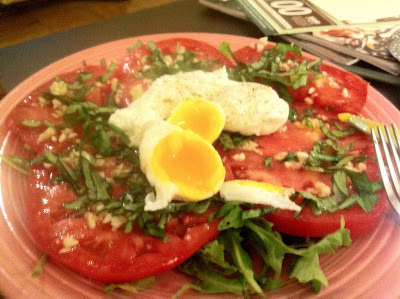 To Plate: Top salad with poached eggs.